51, 42 or 33 hilly miles around Alderley Edge. Ride created by, and ridden in memory of, former member Barry Hyde. We ride Barry’s quirky and challenging creation every February. Its birth date is a little cloudy and archive analysis is currently ongoing. The club’s minutes record a ride in 1996, which would make 2019 our 23rd Circuit of the Edge, but before that the trail goes cold, although the first one may well have been as early as 1990, with 15 riders departing Waters Green, complete with toe clips and straps and down tube gear levers. Barry’s son Jaime later added the ‘Mur de Beeston Brow’ Bollington loop, describing it as ‘an aperitif’ in his classic account of the 2007 Circuit of the Edge ‘A Sunday in Hell’. You’re never far from Macc so it’s easy to abandon if you need to, but with the following five groups, there’ll be a speed to suit everyone: 51 miles at race training pace, 51 miles at Sunday Training Ride pace; 42 miles at Lark Ride / Saturday Club Run pace; 42 miles at Larkling Ride pace; 33 miles at Sunday Easy Ride pace including cafe stop. Or you can ride it by yourself if you want to. All welcome. Start at 9.30 at the Town Hall, SK10 1EA. Cafe at end point Flora Tea Room, SK11 9PG. 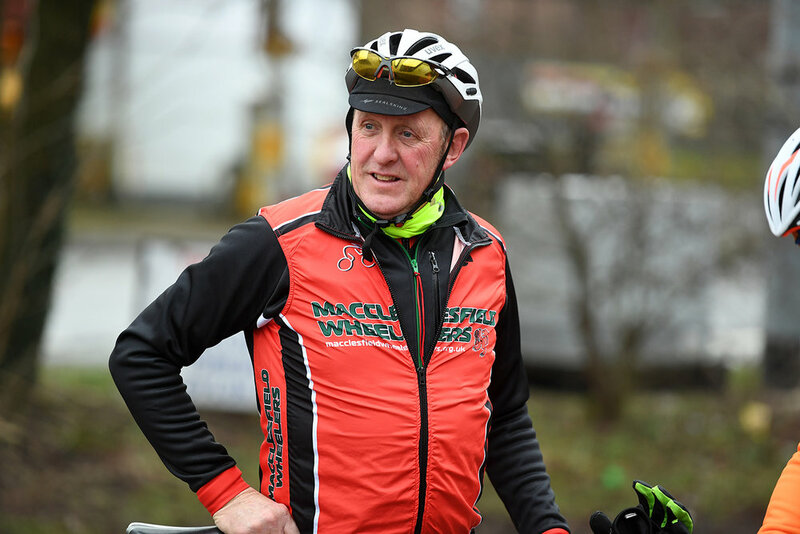 Pat is one of around 80 riders who have turned up today for the Barry Hyde Circuit of the Edge, a ride devised by Hyde himself around the ridge of Alderley Edge, right in between the Peak District and Cheshire Plains. Hyde was a linchpin of the club’s success and since his death his well-devised reliability ride is now seen as a memorial ride. 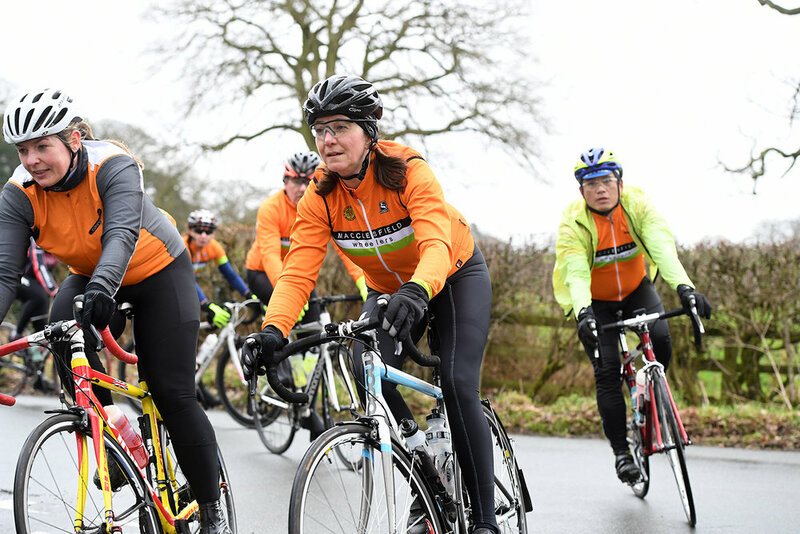 It is indeed a fantastic route with groups of bright orange jerseys criss-crossing the ridge line, passing each other with constant hollers of encouragement and cheery waves. It’s a brilliant way of giving everyone in the club a great workout, with the opportunity to meet up in the cafe afterwards to dissect their rides over a brew or two. Barry Hyde passed away in 2007, aged 74. He was the Veterans Road Race Champion in 1991, 1994 and 1998 and was awarded the Veterans Merit Award in 2002. 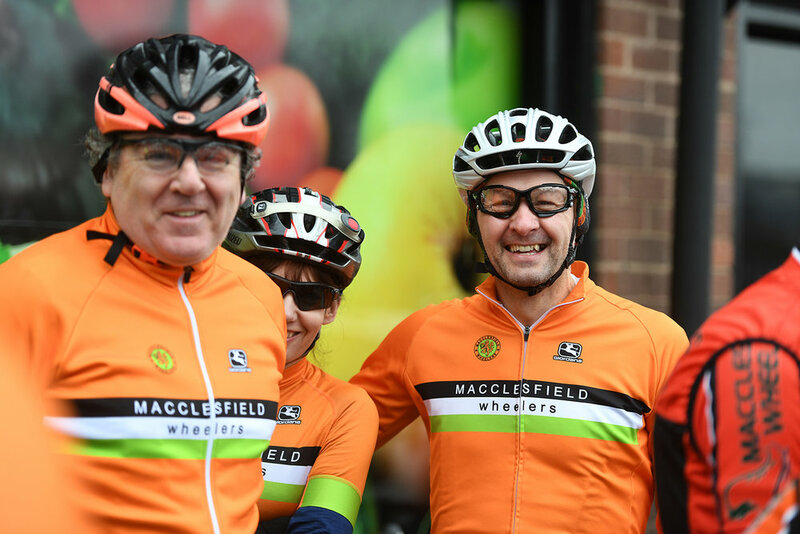 The Circuit of The Edge Ride is named after him because it was Barry who devised the testing, innovative route that packs over 2,000 feet of climbing into its 42 miles, without ever straying more than a few miles from Macclesfield. Barry also started an evening training ride in 1996. His aim was to introduce newcomers and older riders to the joy of riding 'through and off' in a group in a disciplined way: no rapid accelerations and smooth changing was the aim. He made sure no one was intimidated when joining the group. He would nurture beginners and encourage them to keep coming with the words "we all started group riding by going out the back, we have all been there". He would notice people’s bike set-up and give helpful advice. He would also make suggestions to improve pedaling style and use of gears. He was our 'bike dad/uncle'. The slow group started by sharing Thursday night with the 'faster riders'. The slow group would set off first so that fast group riders who were spat out the back, or struggling, could join the slower group as long as they kept to the 'slow group tempo and rules'. I can remember some evenings when the well drilled and smooth-working slow group would start to catch the faster, but more erratic, group after it had overtaken the slow group. This really pleased Barry. If the slow group was infiltrated by faster riders, Barry would give them the cold shoulder and tell them to go away. If they did not, he would slow the group down when they were at the front and let them disappear down the road, or take a turning to lose them. Eventually fed up with the fast riders he changed the night to Monday and subsequently to the three circuits route near Lower Withington. As usual he was being innovative and looked for a course that was quieter and safer for less experienced riders. It also had the advantage of allowing riders who were struggling to take shortcuts and rejoin the group. He encouraged the fitter, more experienced, riders to look after the new starters by dropping back and helping them to stay on and encourage them to turn out again next week. More often than not they would return. Many of the faster club members went through this starter induction. He gave up the running of the slow training group at the end of the 2002 season due to his health issues. He still came out on the rides until the end of the 2005 season. He was a lovely man who is missed by all privileged to know him. This is usually our biggest ride of the year. Get there early enough to have a chat: there are bound to be people you know. An experience not to be forgotten. Put your foot down on the cobbles at the start and you’ll have to walk (or run). 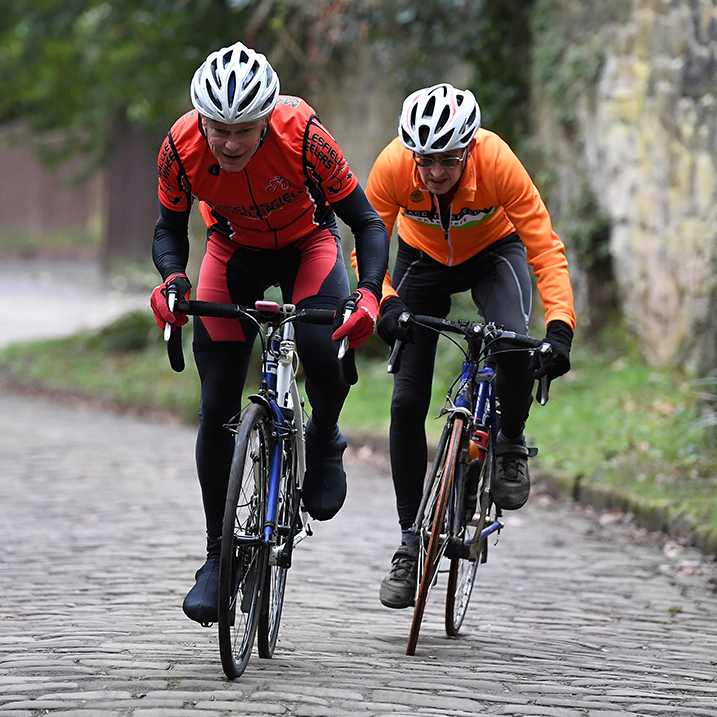 At just 700 metres and rising up to over 20 per cent in places, this cobbled climb is the hardest part of the 42 mile route, but you can opt out by continuing on Trafford Road to Alderley Edge Hill instead. This fast and flowing descent is a welcome relief after climbing Artists Lane. But you’ll be climbing back up it later. Flora Tea Rooms in Henbury. You’ve earned this.